89% of Organizations Use Spreadsheets to Manage Budgets – Really? According to a recent report from Aberdeen Group, 89% of organizations use spreadsheets in the planning, budgeting and forecasting processes. The report is based on a survey of over 200 organizations and goes on to say that despite the level of comfort that many employees have with spreadsheets, there are a lot of challenges that come from using spreadsheets to manage budgets. It calls out version control issues, lack of confidence in the data, and difficulty collaborating across teams as a few of the challenges. When you look at the specific pressures facing organizations in planning, budgeting and forecasting, many of the top ones relate to the problems caused by spreadsheets. 43% cited that market volatility creates the need to dynamically account for change. If you’re working from old versions of a spreadsheet, or if it takes too long to gather and consolidate updates, it’s hard to be agile and respond quickly to changes. 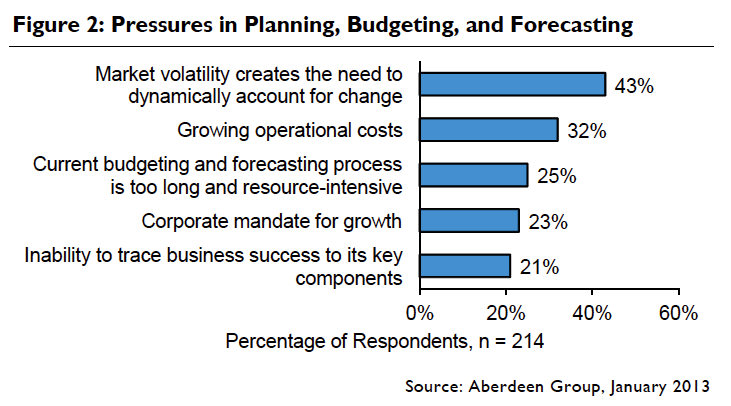 25% indicated that the budgeting and forecasting process is too long and resource intensive. When you have to manually input all of your data and create your templates and formulas, the process is going to take longer. 21% cite an inability to trace business success to its key components. 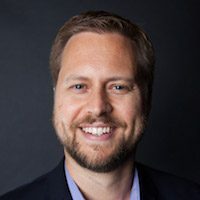 It can be challenging getting business insight from spreadsheets because it’s difficult to link cause and effect, or to tie spend to marketing goals. While the report is not specifically about financial planning in marketing, it discusses financial planning across the organization. Marketers typically have the same challenges from managing their budgets in spreadsheets, and can experience similar benefits from going beyond spreadsheets. According to Aberdeen Group, organizations that go beyond spreadsheets perform better in the performance metrics that lead to greater accuracy in forecasting and budgeting. They see a year-over-year reduction in the time it takes to complete forecasts. They are able to more often produce financial reports in the time they are needed. They’re able to extend spend and performance data access to stakeholders who are able to make use of it. And finally, organizations that go beyond spreadsheets create accurate financial reports 10% more often than their counterparts who rely primarily on spreadsheets. Ultimately, this means that more team members can make better decisions faster. For all the things that spreadsheets do well, scaling for use across teams and regions is not one of them. As we continue into the digital era, where marketing processes become more and more automated everyday, isn’t it time to bring some automation to how we manage our budgets? To learn more about the pitfalls of marketing budget management, check out our LaunchPoint partner Allocadia‘s resources.